Schools: What's the Real Problem? During a recent leadership meeting, a respected, but frequently vocal colleague began venting his frustration about a few of the problems he perceived in our school; apathetic students, lack of consistency, lack of respect, and poor achievement. I looked around at the faces in the conference room wondering if others agreed with this assessment, or were they holding their tongues to avoid confrontation. While most would agree that it's our professional obligation to strive for improvement, I found myself asking, "What is the real problem?" My question comes in the context of reading David Perkins timely and interesting book, Future Wise: Educating Our Children for a Changing World. Perkins general question is "what is worth learning in school?" Lifeworthy learning, a term coined by Perkins, describes knowledge and skills students think with, not merely about. Perkins wants educators to make lifeworthy learning a priority. What are the "big understandings" that will matter to learners now, and in their future? 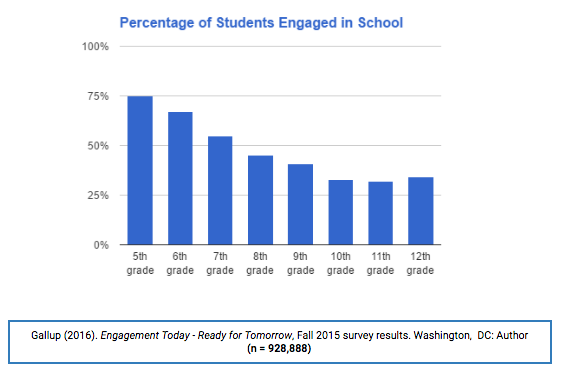 When students find the learning to be relevant, what Perkins calls "lifeready" learning, there is a far greater likelihood of engagement and satisfaction with school. In one of my favorite posts, author Will Richardson suggests the real problem with schools is the long established pattern of reinforcing a culture of teaching (efficiency) instead of cultivating a culture of learning (effectiveness). The real problem is traditional schools, for the most part, are not offering a relevant education to students. We teach too much, and most of the content will be forgotten within weeks of summative assessment. A majority of students have expressed their disinterest in the forced curriculum. Perkins asks educators, "What did you learn during your first twelve years of education that matters in your life today?" The key to providing learning that matters lies in "big questions" and "big understandings"; content and skills that provide learners with meaningful insight, motivate their actions, shape their ethical thought, and offer opportunities for real-world application. Perkins suggests too much emphasis on achievement, information, and expertise can interfere with the development of a lifeworthy, relevant education. While researchers continue to study issues like the relationship between race, income, and the achievement gap, a documented, real problem in schools is the relevancy gap. What needs to be done to close the relevancy gap in schools? Sometimes I wonder if big understandings is the problem. Maybe it is whose big understandings it is. I agree with Perkins explanation of "big understandings". These come from learner inquiry and the development of deep understanding is personalized to the learner. He says the key indicators of big understandings are personal insight, ethical perspective, call for action, and application. In other words, we actually use what we learn. Keep bringing the great content. Love getting your posts delivered to my email. This is engagement - activating mind, body, and spirit to learn more.